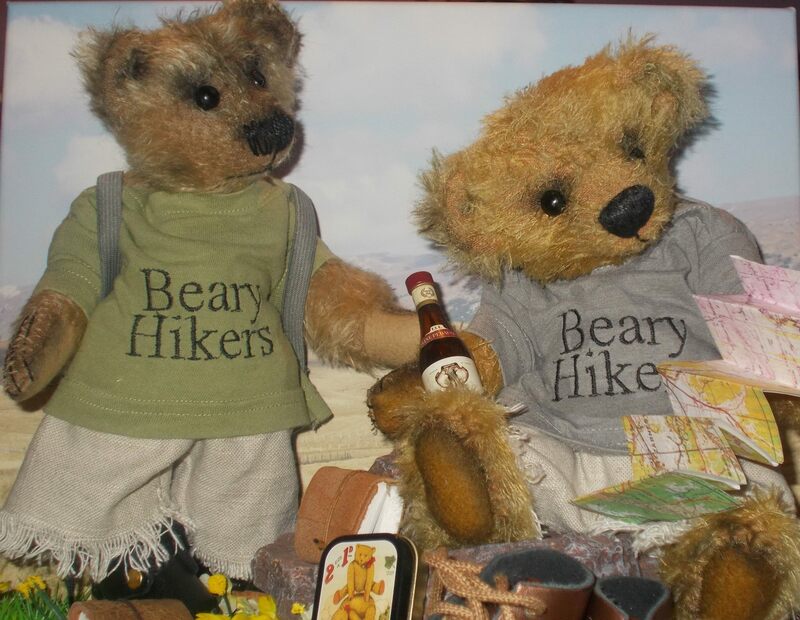 The bears on this page are currently for sale. If you are interested in purchasing one of them, please email us at hugsunlimited@btinternet.com. PLEASE NOTE: These bears are collector's items - not suitable for under 14s. 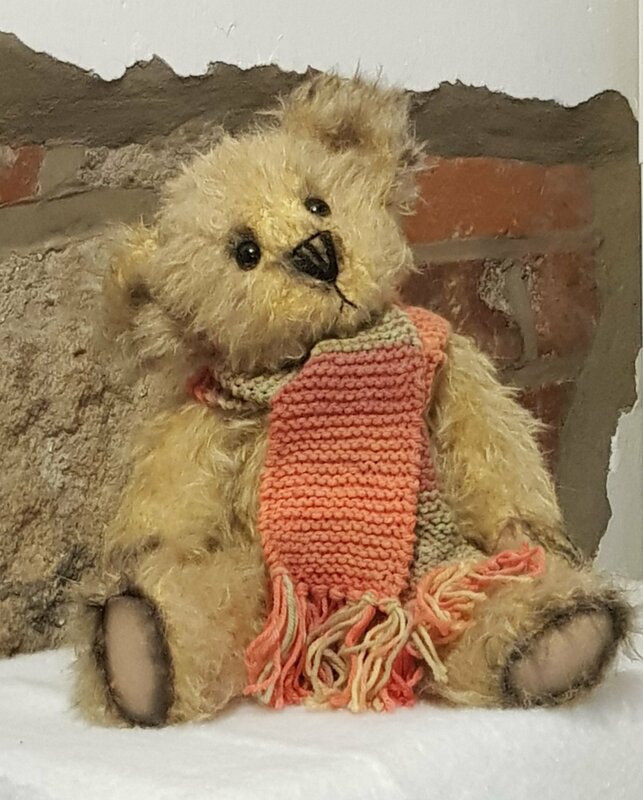 Arthur is a 16 inch traditional mohair boy bear with an adorable attitude. He is made from a very traditional mustard/grey mohair with black hairs woven in to give him an aged look. He is filled with woodwool, cotton, steel balls and glass beads. He has Austrian crystal eyes and has been carefully airbrushed and needle-sculpted to accentuate his kind features. Arthur is wearing a hand knitted scarf. A very friendly and cuddly bear. Reinbunny has been designed with nature in mind. He represents the forest and the gathering of food and decorations for the yule period. He is gradually filling his glass jar with pinecones and various natural decorations. He is part of the Hugs Unlimited winter collection, along with Rowan, Holly and Oisin. Reinbunny has been designed and made by myself, Dawn James of Hugs Unlimited. He is a mohair collectible hare with a very sweet expression. Reinbunny is filled with a variety of fillings, woodwool, cotton, glass beads and steel balls to give him a reassuringly weighty feel. His paws are vintage green velvet, and his eyes are antique boot buttons. He has been carefully needlesculpted and airbrushed to accentuate his features. Oisin has been designed with nature in mind. He represents the forest and the gathering of food and decorations for the yule period. He is gradually filling his glass jar with pinecones and various natural decorations. He is part of the Hugs Unlimited winter collection, along with Rowan, Holly and Reinbunny. Oisin has been designed and made by myself, Dawn James of Hugs Unlimited. 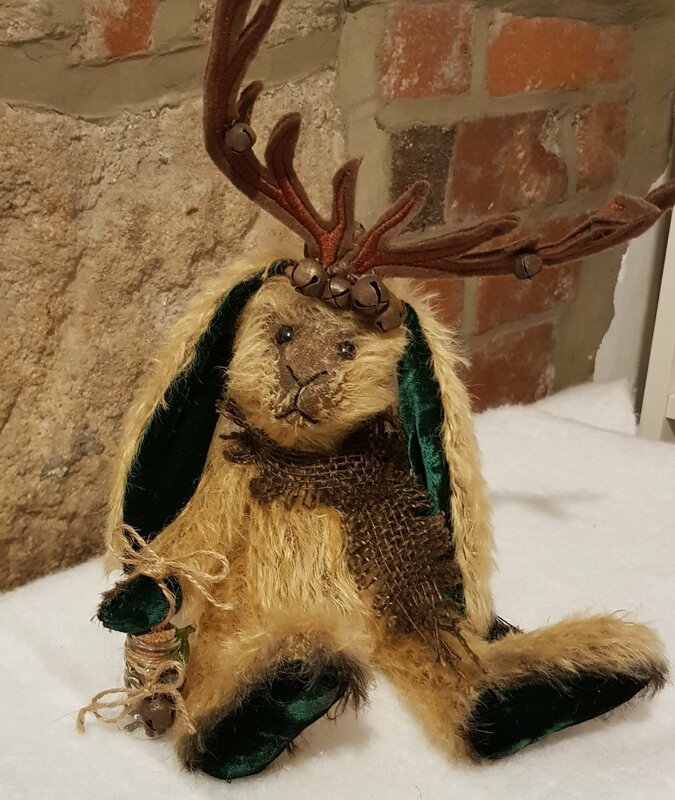 He is a mohair collectible hare with a very sweet expression. Oisin is filled with a variety of fillings, woodwool, cotton, glass beads and steel balls to give him a reassuringly weighty feel. His paws are vintage green velvet, and his eyes are antique boot buttons. He has been carefully needlesculpted and airbrushed to accentuate his features. Holly has been designed with nature in mind. She represents the forest and the gathering of food and decorations for the yule period. She is gradually filling her basket with spices and various natural decorations. She is part of the Hugs Unlimited winter collection, along with Rowan, Reinbunny and Oisin. Her beautiful vintage velvet wrap features an embroidery of pine branches and a robin. Holly has been designed and made by myself, Dawn James of Hugs Unlimited. She is a mohair collectible bear with a very sweet expression. Holly is filled with a variety of fillings, woodwool, cotton, glass beads and steel balls to give her a reassuringly weighty feel. Her paws are 100% wool felt, and her eyes are premium crystal. She has been carefully needlesculpted and airbrushed to accentuate her features. Rowan has been designed with nature in mind. He represents the forest and the gathering of food and decorations for the yule period. He is gradually filling his sleigh with spices, wood, a tree and various natural decorations. 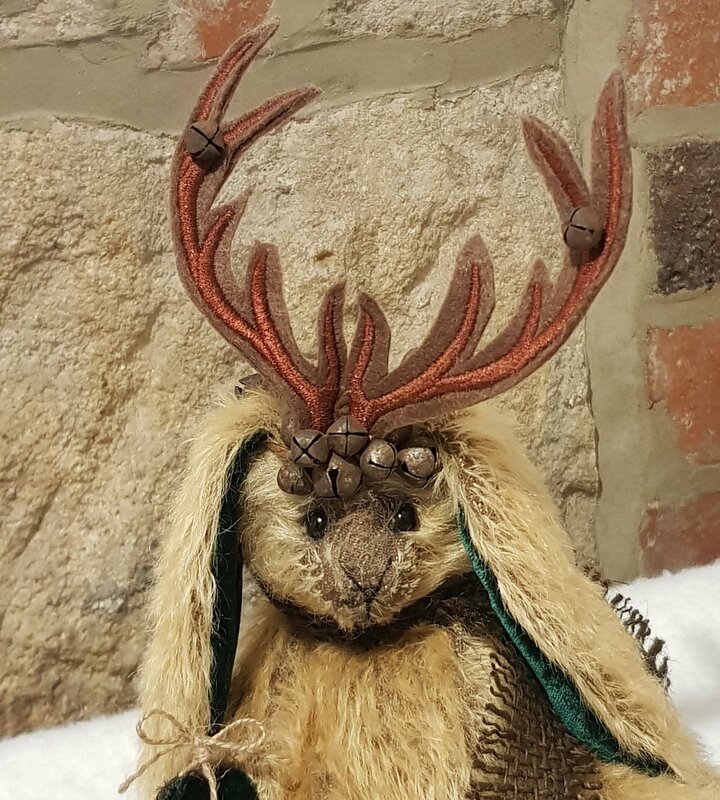 He is part of the Hugs Unlimited winter collection, along with Holly, Reinbunny and Oisin. 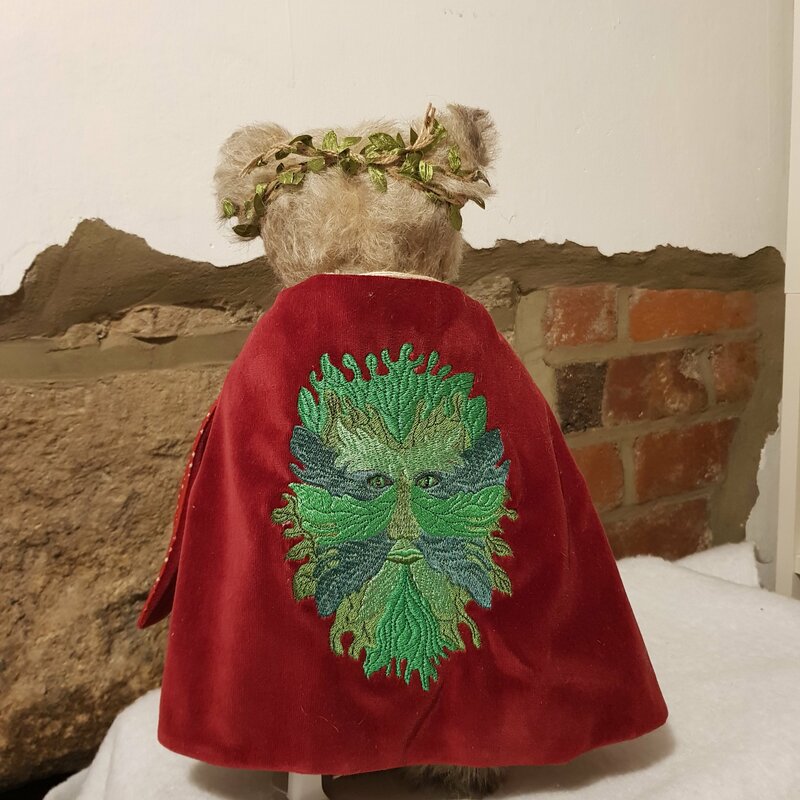 His beautiful vintage velvet cloak features an embroidery of the Green Man on the back. He also wears a vintage Celtic brooch. Rowan has been designed and made by myself, Dawn James of Hugs Unlimited. 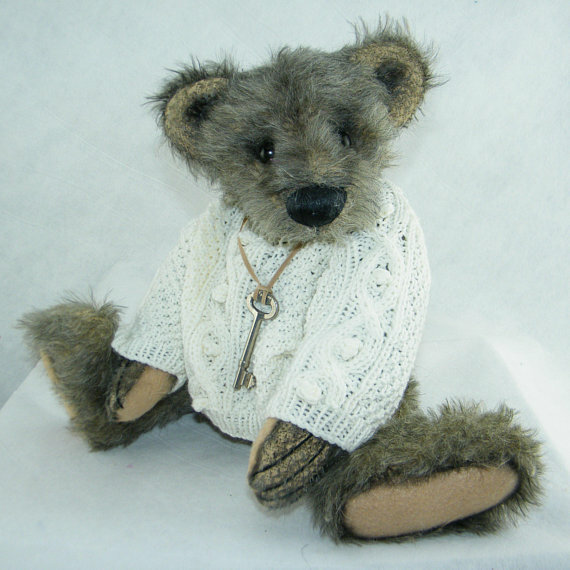 He is a mohair collectible bear with a very sweet expression. He is filled with a variety of fillings, woodwool, cotton, glass beads and steel balls to give him a reassuringly weighty feel. His paws are 100% wool felt, and his eyes are premium crystal. He has been carefully needlesculpted and airbrushed to accentuate his features. The weight of his sleigh means that he cannot be sent outside of the UK. If you are outside of the UK and would like to purchase Rowan without the sleigh please contact us. Sweet Pea is an 11 inch hare. 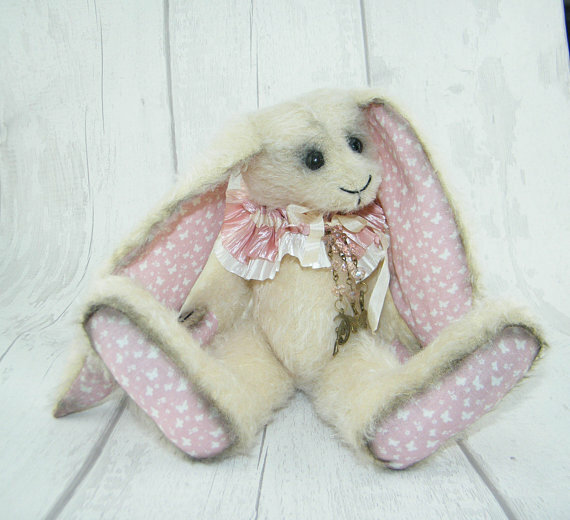 He is made from cream mohair with cotton paws in a lovely pink butterfly pattern. He has various fillings including cotton, woodwool, glass and steel beads to give him a good weight. His big ears are also weighted to give him extra character. Sweet Pea has antique boot button eyes and has been carefully airbrushed and needle-sculpted. He is wearing a silky ruff in two colours which is decorated with charms and crystals and finished off with a silk bow. Sweet Pea has a lot of character and an adorable expression. 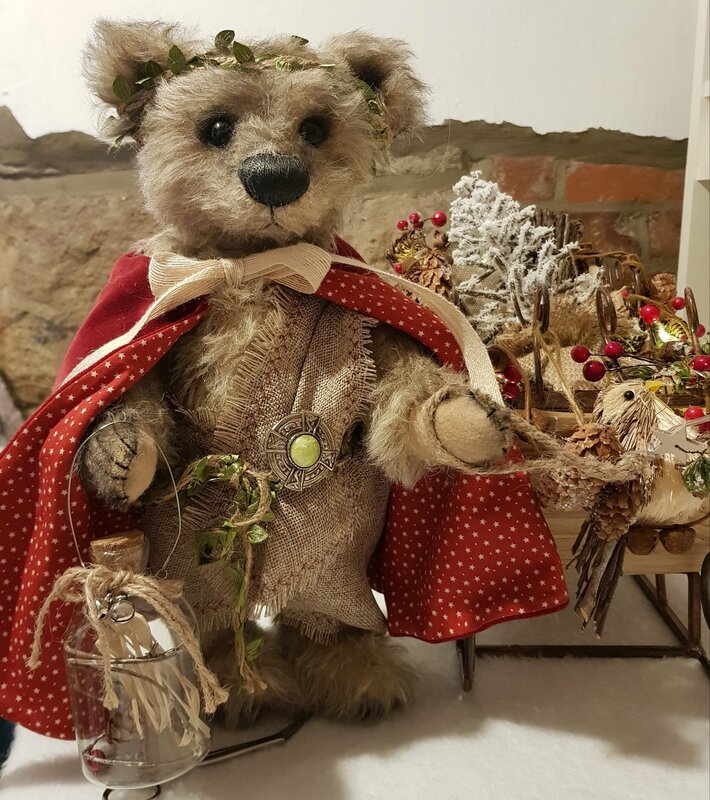 Peter is a big 16 inch traditional mohair boy bear with an adorable attitude. He is made from a very traditional grey mohair with black hairs woven in to give him an aged look. He is filled with woodwool, cotton, steel balls and glass beads. He has Austrian crystal eyes and has been carefully airbrushed and needle-sculpted to accentuate his kind features. Peter is wearing a hand knitted Aran jumper and has a lucky vintage key with him. A very friendly and cuddly bear. 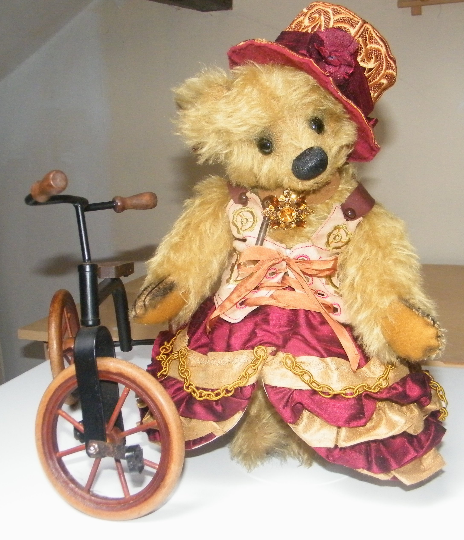 Clara is a fabulous golden mohair 13 inch Steampunk bear. She is made from high quality mohair with 100% wool felt paws. She is filled with woodwool, cotton, steel balls and glass beads. She has antique boot button eyes and has been carefully airbrushed and needle-sculpted to accentuate her features. Clara is wearing a faux suede embroidered basque with antique buttons, and a silk ribbon bow. Fully lined ruffled silk skirt in a rich gold and burgundy with silk chain, a embroidered hat also made from silk with silk flower, and a beautiful vintage brooch and key on an ultrasuede choker. I have found the perfect vintage tricycle for Clara to stand by, and this is included in the price. Underneath all her finery Clara is a cute traditional teddy bear. Clara is currently available from Wonderfully Made, 11 Halifax Road, Todmorden OL14 5AG - or email us if you don't live nearby. 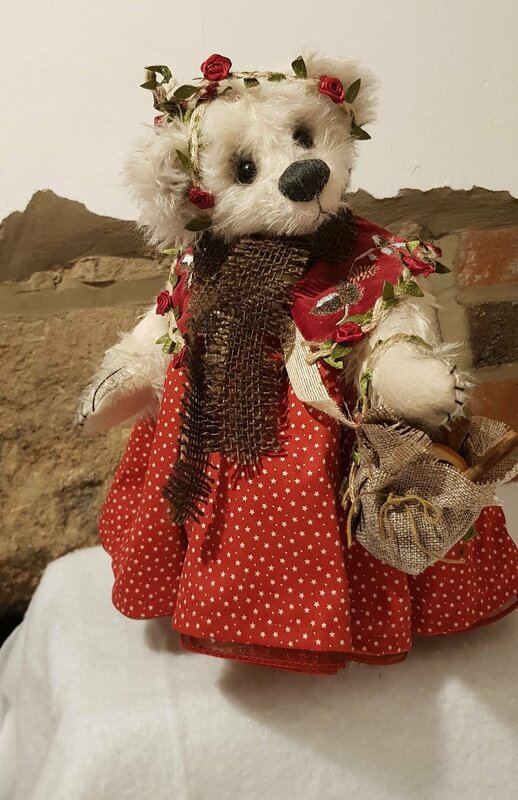 Dawn's bears can also be found at Teddy Bears Of Witney, 99 High Street, Witney, Oxfordshire, OX28 6HY and Wonderfully Made, 11 Halifax Road, Todmorden OL14 5AG.